The treatment of Julia Gillard and her Government should give us all pause to look at the wider issues at play, says Anna Sande, explaining what this sordid period says about "modern Australia". ON THE EVENING of the 26th of June, just after 6pm, I descended to the underground train platform. There were still a number of commuters waiting for the train home after work. I didn't feel like standing. I made my way down and along to one of the few seating possibilities. There was a seat between two young men. I had just settled in when the one to my right, leaned toward me and spoke – somewhat loudly – like a person unaccustomed to public volume. None of us were happy. How could this have happened? Really? What hope was there? The young man on my left and I kind of verbally bumped into each other, like drunks, blind and hurt, blurting out epithets. It was the coldest it had ever been in south-east Australia, the full moon was at perigee, Guardian Australia was being launched and it was the last episode of Borgen. Momentous. Was it distress about the idea of Tony Abbott in the Lodge that had pre-empted due process? That I could understand. The number of commentators on the dismissal of Prime Minister Julia Gillard by her own party is similar in number to the variety of opinions on the subject. It is curious there is so little accord and such meager acknowledgement of the calm grace of her unscripted farewell speech that night. We need to take a bigger picture. We live in a so-called "risk society." Being risk-averse means we toe the line. Some would have us believe there is risk around every corner. Subliminal forces would have us stay close to the predictable straight and narrow — so as to better manage us for their, and our, well-being. A marketable and measurable entity, we should know how expensive and hazardous it is to step out of line. Some, nonetheless, swim against the flow and, increasingly frequently, whole public squares of people come together in the realisation they have been duped. A few step out alone like Assange and Snowden. They may have a messianic streak. They may see the world differently than most can afford to. They have achieved their goal if we are aware of them and have a vague idea of what they are revealing, if not the full details. When times are tougher, we may investigate further. 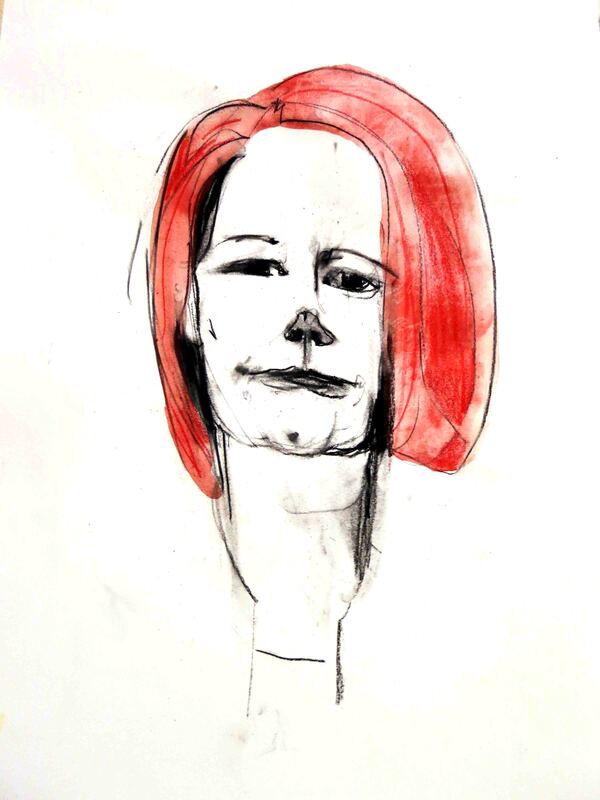 Julia Gillard wasn't on the Australian script, but in the Australian spirit we gave her a go. She had that go, stepped out of line and she didn't measure up. She was never meant to. When you learn to trust others and their opinions, rather than your own, you can be sure the risk society has you in its grip. We need to learn to enjoy disagreement. Take it up as a chance to tease out a subject. View it from various perspectives. Flex our opinions. Empathise. Ducking and weaving on the part of elected politicians is risk aversion at its slipperiest, most public, and ugliest. It speaks of dishonesty. Dishonesty on a large and consequential scale. It is the kind of behaviour that should be anathema to most elected leaders. They are there to make the tough often unpopular decisions they believe are correct. Instead the 'party' now dictates the need for advisors to sniff out risk; pollsters are constantly indicating what whim is on the rise today. The media enthusiastically encourages this anxiety. Even a weekend post-mortem by senior writer Peter Hartcher, entitled 'We need to talk about Kevin', refers repeatedly to a 'researcher of public opinion' and a 'political psychologist', as though Hartcher himself didn't trust his opinion. The Conversation contributor, Shaun Carney, does a good job pointing out all Gillard's mistakes. He seems to feel there is no mystery as to why she was ousted. the peremptory announcement of an election date nine months in advance. According to Carney, these were all factors in the downfall of Julia Gillard. The public marked her down over these measures. It should be noted however, that Gillard did not make these decisions entirely on her own. Given his thesis, he was dismissive of her farewell speech which he described as niggardly in its seeking for causes. 'There was no acknowledgement that she had lost the confidence of most of her colleagues because of her own performance'. Why then did so many significant Labor figures resign, or clearly refuse to change allegiance? And what of the significant achievements of Gillard's tenure? Risk aversion makes for reaction rather than origination. It seems a national rather than a specifically political malaise. These events have proved that Australians are opportunists, swinging in behind Rudd as down some well-worn path. David Marr reminds us that Kevin Rudd's 'self-belief is bottomless'. Although less than liked in the party, the annoyance and frustration for politicians is that the public have yet to catch on. This disconnect may yet spell doom for Labor. Who could not be horrified to discover Chris Bowen, the apotheosis of vacuity, as Treasurer? A front, not a financier. Watch this interview with ABC 7.30s Leigh Sales for confirmation of his determined and uninspiring insistence on nothing. On June 13, Anne Summers rued the figures of gender imbalance should Abbott come to government in September. Piterman offers figures about what she calls 'board games'. These suggest that, despite the best efforts of various forces within corporate governance, female participation in organisations with an 'influence footprint' has stalled and possibly even retreated. There is 'dissonance between corporate citizenship and profitability'. She elaborates, saying: 'business practice that privileges the short term and immediate over the sustainable and ethical'. In her opinion, female labour is treated as 'disposable' and corporations embrace or dispense with it 'according to the vagaries of the economy'. Leadership and masculinity are in a hoary, thorny, nexus in the minds of men and women. James Bond has become a street fighter. Men are less than chivalrous, according to Russell Crowe. Despite this, the masculine lexicon is linked in most of our minds to leadership. The adjectives 'tough and driven' might fit Julia Gillard, but in doing so they compromised her standing as a woman. She is a woman and herein lies the impossible bind — who wants a leader who is tough and driven as well as being female? The fit is uncomfortable. It is ugly. Overt shameless objectification – disrespectful to the point of degradation – is endlessly droned on about in all forms of media. It makes Australia seem a sad, gutless, wonder in the eyes of the world. Reviled as crass and inhumane. The tragedy is this kind of talk has achieved its goal. When leadership is so disposable – a presidential approach, without the public privilege of voting for the leader – this surely can only turn off the public? Instead, there has been political turnaround according to polls taken over the weekend after the ousting of our first female prime minister. Oh, our memory is so short! As the audience – not participants – we have lost the opportunity to give Julia Gillard a fair chance. To acknowledge the very real achievements of her government. Who cares if Rudd "saves the furniture"? Very few of the eligible young voters, according to Amanda Lohrey of The Monthly. It's how the least of us is treated. "I have been shocked, frankly, over the last three years, to meet ugly Australia and just to see the width and depth of ugly Australia." As I left the train station, I spontaneously struck up a conversation with a fellow female pedestrian. She said she was thinking of emigrating to New Zealand.